If only we could clone Musk and Branson… Their innovative leadership improves lives, helps our planet AND propels space exploration… FAB combo! Musk’s SpaceX developed reusable rockets for space flight. Last week, he unveiled plans for a city to city rocket transport system, to fly people from London to NY in 30 minutes, a manned Mars mission by 2024, and the Boring project – boring tunnels under L.A. to ease gridlock! BBC: Renewable energy entrepreneur Elon Musk says he could rebuild Puerto Rico’s shattered electrical infrastructure with his solar energy technology. The vast majority of the island territory remains without power, weeks after it was hit by Hurricane Maria. On Twitter, Mr Musk said his technology, which powers several smaller islands, could be scaled up to work for Puerto Rico. The island’s governor responded to Mr Musk with the message: “Let’s talk”. “Do you want to show the world the power and scalability of your Tesla technologies? Puerto Rico could be that flagship project,” the Governor of Puerto Rico, Ricardo Rossello, said. Mr Musk’s Tesla company is best known for its electric cars, but it also incorporates SolarCity – a solar panel firm which specialises in efficiently storing large amounts of electricity in power banks. 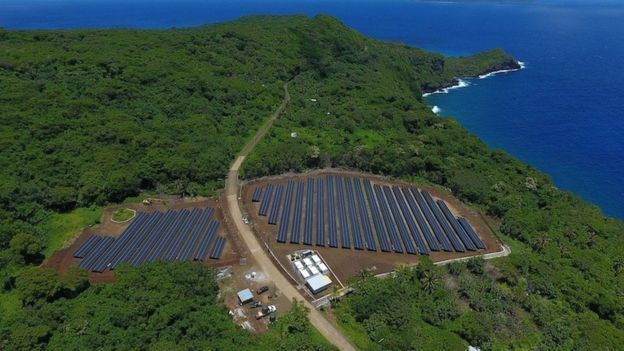 The company says it has powered small islands, such as Ta’u in American Samoa. There, it installed a solar grid which can power the entire island and store enough electricity for three days without any sun. The latest conversation is reminiscent of the bet started on Twitter between Mr Musk and an Australian software entrepreneur which led to plans for the world’s largest battery storage project in South Australia. That battery installation – which Tesla guaranteed could be working “100 days from contract signature” – was declared half-built within days of the start of construction.